From left to right, 1) pinched loop, 2) single loop in loop, 3) two-way loop in loop, 4) double loop in loop, 5) two-way double loop in loop, 6) triple loop in loop, 7) multiple woven mesh, 8) thai weave. 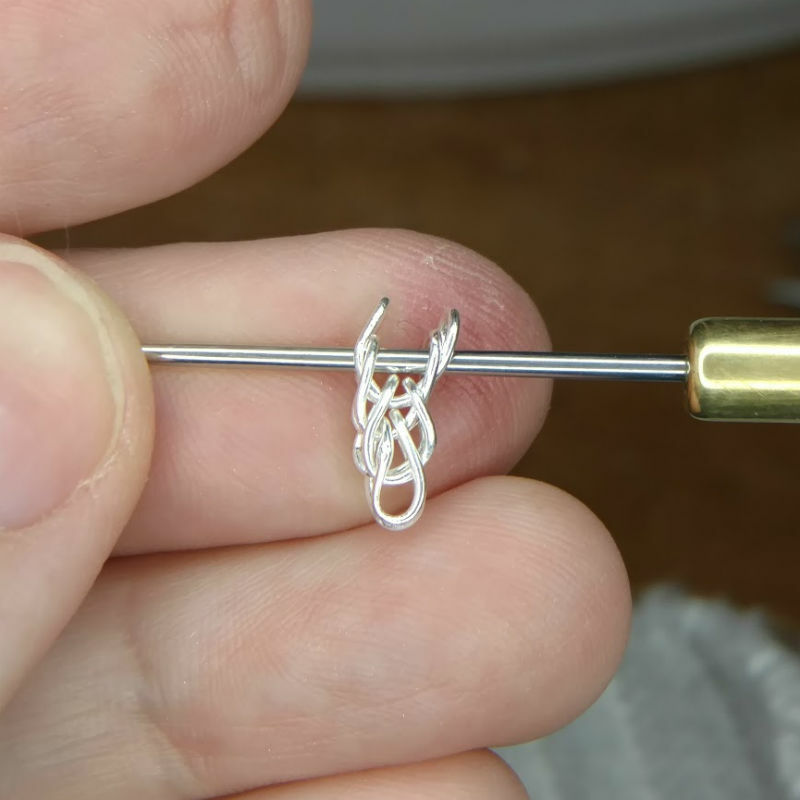 One of my favorite chain-making techniques is called Loop-in-Loop, dating back to approximately 3000 B.C. Due to the high quality of these chains found in royal graves at Ur, it’s thought that perhaps this chain type dates back even further. This method of creating chains was used until the end of the Middle Ages. The earliest known examples of this technique are in the form of the single loop-in-loop chain, shown second from the left in the photo at the top of this page. The double loop-in-loop pattern (4th from the left) was prominent during the Roman period. By the third century B.C., multi-row chains were woven, such as the photo second from the right. The method for creating these chains is relatively straightforward. Wire is wound into a coil, and that coil is then cut into individual rings. The rings are carefully closed and placed on a charcoal block or other soldering surface. With heat alone, the material is fused into a closed circle. Traditionally made in 22K gold, fine silver (99.9% silver) is also used. Both of these materials are chosen since, because of their purity, they will fuse closed without any need for additional solder. Once the rings are fused, they are then formed into a shape similar to a dumbbell. These rings will then be individually woven into the chain. The size of the rings and the pattern into which they are woven determines the style of chain which will result. The simplest form of the loop-in-loop chain is the single loop-in-loop, shown below. A link, previously formed into a dumbbell shape, is passed through the ends of the previous link. The next type is a two-way single loop-in-loop chain. In this chain, we begin with two formed links laying across each other in the shape of an X. As links are placed, the chain rotates 90 degrees, alternating sides into which the new links are placed. Do you notice the increase in complexity of the weave from the one above? There are essentially two single loop-and-loop chains combined together. Each link is still just going through one previous link, though. The needle in the photo below shows the path of the next link. What follows is the… can you guess? It’s the three-way single loop in loop! The chain is begun with three links crossing one another, and each link fits into a single link before it. Whereas the two previous weaves produce a square chain, the three-way chain produces a beautiful round chain. There is an additional weave that I make that technically fits into this category, called multiple woven single loop-in-loop mesh. This chain is begun with multiple links lined up side by side, soldered together, and then formed into a U-shape. A longer link runs through each row, essentially creating a two-way single loop-in-loop chain. The simplest form of the double loop-in-loop chain is shown below. This was the predominant chain type of the ancient world. This is a one-way pattern where one single link is put through two previous links. Just as was the case with the single loop-in-loop chains, the next progression is the two-way double loop-in-loop chain, a beautiful, round chain. This chain is begun with two formed links laying across each other in the shape of an X. As links are placed, the chain is rotated 90 degrees, alternating sides into which the new links are placed. The needle in the photo below shows the path of the next link. These chains can become increasingly complex as you add directions, such as the three-way double loop-in-loop and the four-way double loop-in-loop chains. I personally have not made these chains since they make a truly hefty chain and I prefer more delicate, slender chains. One modification of this type of weave was developed by Jean Stark, is called Thai Weave. This is essentially a double loop-in-loop variant done on a diagonal, producing a gorgeous, flat chain. Once a chain is constructed, it is annealed with the torch, bringing the piece to a temperature where it begins to glow red. This process makes the metal more malleable so that the chain can be either tamped with a mallet or pulled through a drawplate (a board with a series different sized holes drilled in it), both which improve the uniformity of the chain. Below is a video showing the weaving of a loop in loop chain.